How quickly time passes and we’ve already completed seven weeks of school. We are having many new experiences, learning class routines, sharing, taking turns, walking in a line, using walking feet, and inside voices to name a few. 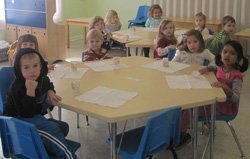 For some of us, this is our first year in preschool but everyone has adjusted nicely and is enjoying playing with their new friends. Our hallway and classroom have been decorated for fall and Halloween by our class. 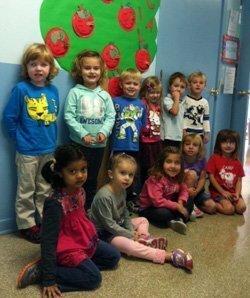 We stamped with apples, finger painted pumpkins, made colorful fall trees with our hand and arm, cut out bats, and created an “I Am Special Tree”. The children love to see their art work displayed for everyone to see. Our days are busy from the time the children arrive until the end of the day. After everyone arrives we have our Morning Meeting. We are assigned a letter to sit on which changes monthly. We love to have turns being the leader, forecasting the weather, helping with our calendar, and holding the flag while we recite “The Pledge of Allegiance.” We are getting good at knowing which is our right hand. Guessing what is in the Mystery Box after the clues are given is fun. We are very good at solving the clues given and whoever is right gets to open the box. We’ll discuss the day’s activities and sometimes play games or share a special memory or treasure from home with the class. Getting up in front of a group to speak can be difficult, but we see their self confidence improving and they enjoy being the center of attention. Next we have centers set up in the classroom where we can challenge our minds, verbal, social and fine motor skills. 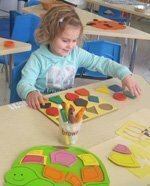 Playing with play dough or at the water or cornmeal tables are fun tactile and fine motor experiences. At the tables there are a variety of manipulatives, i.e. blocks, Legos, bristle blocks, gears and etc. from which we can choose. We especially enjoy the dress-up and dramatic play areas where we like to try out our culinary skills. There are puzzles, pegs, sorting, sequencing, patterning, matching, lacing, stringing, magnetic shapes, and letters for us to play with. It takes a lot of patience to wait our turn or to ask another child to share a toy with us. Using our words is an important means to communicate our needs both with our friends and with the teachers. We also can either paint or draw at the easel. Working with the teacher one-on-one is something we look forward to. We practice our cutting, writing, drawing and gluing skills while having time to spend with our teachers. After cleaning up our room, it’s snack time. We enjoy sitting with our friends and chatting. When we’re done eating, we have quiet library time while waiting for everyone to finish eating. Once everyone has finished, our teacher reads a special story to us. Every first Monday of the month either Pastor Mark or Todd comes to tell us a Bible story which we all look forward to. We’re especially good listeners at this time. We love going to specials like music, language arts, and gym, but I think our favorite time has been outside on the playground. The weather has been fabulous and provides us with an opportunity to meet other friends, as well as strengthen and improve our coordination, balance, and gross motor skills. Our teachers love their time with the children who always bring a smile with the things they say and do.